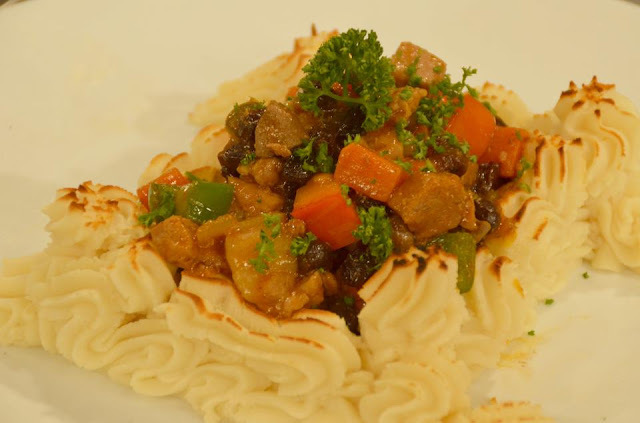 Pork Menudo with Mashed Potato is an all-time Filipino favorite. Indeed, which Pinoy festive spread does not have it? In Chef Boy's version, the dish nestles inside a fence of mashed potato to further accentuate the unforgettable fining experience. 1. Combine pork kasim, pork liver, patis, salt, pepper. Mix well and let stand inside refrigerator for 30 minutes. 2. Heat oil in pan. Sauté garlic and marinate pork mixture. 3. Add tomato paste, tomato sauce and water. Cover and simmer over medium heat for 15 minutes or until meat is tender. 4. Add carrots, red bell pepper, green bell pepper, raisin, salt, pepper and powder seasoning. 5. Mix well and cook for another 5 minutes. 6. Scoop mashed potato on pate over the top with menudo.